Cycling is one of the fastest growing transportation modes in Toronto. According to the 2016 Census, 2.7 percent of Torontonians bike to work (city-wide average), up from 1.7 percent in 2006, with some downtown neighbourhoods in the range of 15 to 30 percent. Cycling provides many benefits, including easing congestion on the streets and transit, a cleaner environment, and the health benefits that active transportation provides. 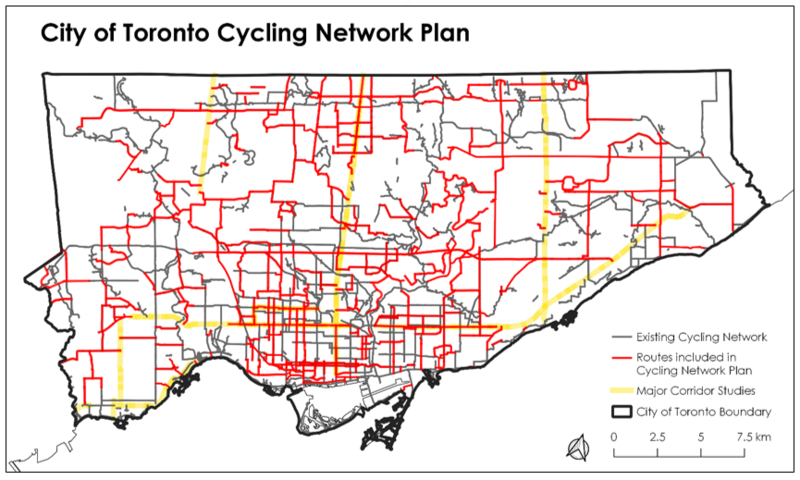 The Ten-Year Cycling Network Plan guides the City’s investment in connecting, growing, and renewing cycling infrastructure across Toronto from 2016 to 2025. Expanding and enhancing cycling infrastructure is an important pillar of the Vision Zero Road Safety Plan, which focuses on reducing traffic-related fatalities and serious injuries on Toronto’s streets. Since the approval of the Ten-Year Cycling Network Plan in 2016, approximately 5 percent of the proposed kilometres of cycling infrastructure has been installed. 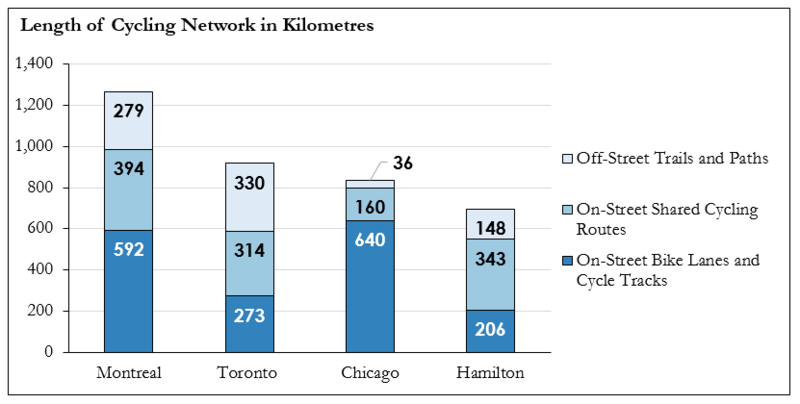 Toronto has a respectable cycling network but needs to accelerate implementation to catch up to more bicycle-friendly cities in North America and the world. City staff will present City Council with an updated cycling network plan in 2019, with an extended outlook to 2028. The update will include information regarding implementation progress, a review of project timing, recommendations on funding, requests to initiate additional Major Corridor Studies, and plans for the implementation of the bikeway identified in the Eglinton Connects Environmental Assessment. Transportation Services is aligning the timing for cycling infrastructure projects with an updated road work program, which will provide a more up-to-date projection than what was available at the time of the original cycling network plan and enable the City to better coordinate the delivery of cycling infrastructure projects with other road work. Internal and external stakeholder engagement for the review of the cycling network plan is underway (June to November 2018), and the original cycling impact analyses and priority rankings are being updated with more recent data sources (such as 2016 Transportation Tomorrow Survey results), enhanced methodology and equity considerations. In 2016, City Council approved the Ten-Year Cycling Network Plan with support in principle for annual capital funding of $16 million. The Plan identifies opportunities for cycling infrastructure investments in every part of Toronto. It includes recommendations for cycle tracks or bike lanes on fast, busy streets; recommendations for traffic-calmed routes with cycling wayfinding on quiet streets; recommendations for new boulevard trails, adjacent to fast busy streets where cycling may be less comfortable in the roadway, and identifies areas where tunnels or bridges may be studied to cross major barriers. Multi-use trails provide important cycling connections to and through parks, and along hydro corridors, ravines, and rail lines. Transportation Services and Parks, Forestry & Recreation as well as the Toronto and Region Conservation Authority work in partnership on these projects. 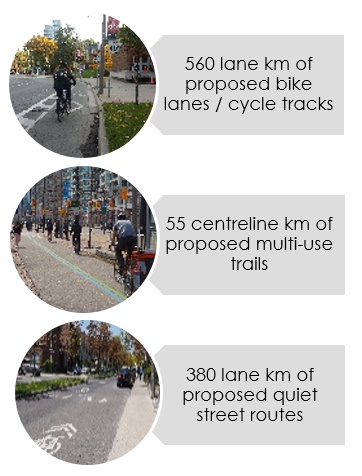 Since the approval of the Ten-Year Cycling Network Plan in 2016, approximately 5 percent of the proposed kilometres have been installed, which reflects that projects take time to move through the design and approval process and need to be coordinated and, often bundled, with other work two to three years out to minimize disruption. As the City approaches year three of the Plan progress on installation is expected to accelerate. Montreal is the only North American city to make the Top 20 in the 2017 Copenhagenize Index, “the world’s most comprehensive inventory and ranking of bicycle-friendly cities.” When compared to Montreal, Toronto’s cycling network is lagging, particularly with on-street dedicated cycling facilities. Where Toronto demonstrates leadership is with the trail network. In absolute trail kilometres, Toronto leads among the four cities measured here (Toronto, Hamilton, Montreal, and Chicago). Against Chicago, one of Toronto’s most similar American neighbours, Toronto demonstrates a more robust network of off-street trails as well as shared cycling routes but has installed less than half the length of bike lanes and cycle tracks. Though Toronto performs better than nearby Hamilton in absolute numbers, Hamilton outperforms all of the cities here when it comes to per capita infrastructure. City Council endorsed in principle the Ten-Year Cycling Network Plan capital program in 2016. Individual projects in the Ten-Year Cycling Network Plan still require Council approval. Before presenting the project to Council, City staff will undertake feasibility analyses, conduct public consultations, and prepare reports, including bylaw amendments. $25.6 million from the Ontario Municipal Commuter Cycling program (2018 to 2020 – 80 percent funded by the Province of Ontario and 20 percent by the City). There are 18 Cycling projects planned in 2019, subject to design feasibility, public consultation, approvals, and capital coordination. The TTC, with the City of Toronto and Federal Government support are installing more than 1,400 more bicycle parking spaces at 40 TTC stations across the City by the end of 2019. New Bike Stations (secure bike parking) at City Hall and Finch West station will open by the end of this year, with 175 and 80 long-term spaces respectively. Bike Share Toronto, operated by the Toronto Parking Authority, is expanding by an additional 90 stations this year to a system total of 360 stations, with 3,750 bikes, and 6,200 docking points.